As in keep your eyes open, but more on that in a moment. Early morning is a delicious time on the Rogue River. There is a mix of shade and light pleasing to the setting. Bankside trees shadow pools, sunlight illuminates riffles. Early morning comfort food for the soul and mind. If I am first on the water, I always expect a ready immediate strike. Of course I always prepare my anticipation for a delayed response. Sometimes the fish have to wake up. Such it was this morning. The bite did not come until 9:00 AM. A little peck…I was a slow to react, but it didn’t matter. The hen was stuck and landed. 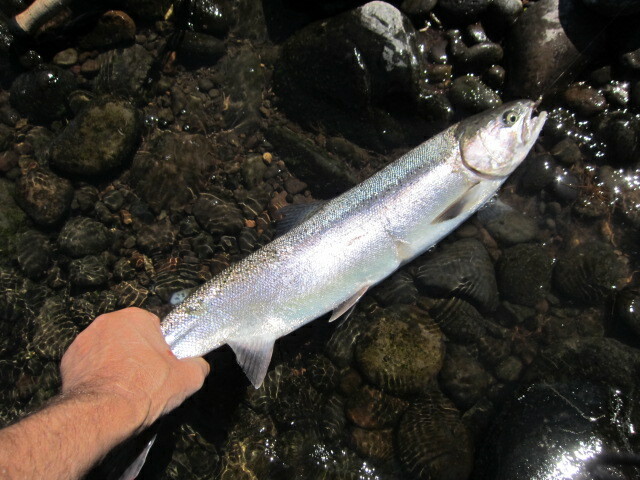 Another hatchery hen and I’m happy to note that they have all been good fish this early season coming in around 25″ long. I don’t know if it has just been my catches, but the early runs seems devoid of the 18″ fish. An indication of good ocean conditions? To set my evening dinner fare the fat hen was duly processed and hung from a tree. A Crunchy Peanut Butter Clif Bar took away the morning hunger in my belly as I further rested the water. Once back to casting, time past uneventful for a good two hours. I could see that the yellow jacket bees had found my dressed fish. Share the wealth, they wouldn’t be taking much. As it was going, it seemed I wouldn’t be taking anything more out of this hole. 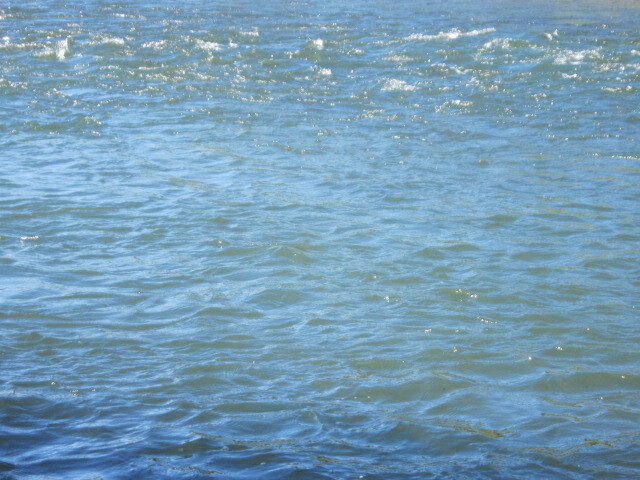 Then suddenly I saw a rolling dark fish in the seam line between choppy and smooth water. Downstream and away the location called for a classic wet fly swing. Now if the fish was a jack salmon my chances were probably nil. A steelhead showing and orientated toward the surface might take immediately. To say the very least that is where a fish was and that was where I would cast. With the second cast I put sufficient mend into the swing and I was rewarded with a stirring strike. A steelhead and definitely a good one. Or perhaps just a wild one? I worried that the fish would move into the fast water and race away downstream. That would make matters most tricky. As luck would have it I snubbed away most of that first move and keep the action in the slower flow. Utilizing the power of the 13′ Spey rod I walked the fish upstream where I could play her out in the headwater of the run. For a brief moment I controlled the wild hen at the bank as I removed the Bead Head Hare & Pheasant from where it was stuck in her jaw. After a week of blistering weather I welcomed the change. The weather forecast called for an afternoon high of only 88°F. Best of all the day was to begin in the 50°s. If I got out early with luck I could be home before the noontime 77°F temperature. By the time I walked to the river the sun was up. At the first run shade still darkened most of the water. To start at the top I stood in the sun. It felt different today. A few days before even in the early morning I could sense the coming oppressive heat. Today I stood comfortably. Now would the fish be receptive in this cooler world? I figured the heat had put the bite off those few days before. Still I plied the sunlit water at the head of the run first. To fish the run thoroughly I would start there no matter how inviting the dark water below looked. Pluck, pluck, pluck…there she was a first player. Never overlook the tumbling water at the top of a run. 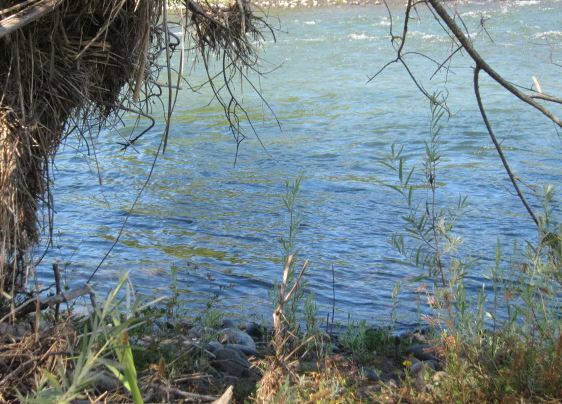 A big arch in the Spey rod and my several bows to the leaping fish followed. Then of all things a long run upriver! The wrong move and I soon corralled the silver hatchery hen in the shallow water. After attending to the landed fish, I sat and rested the water for a while. Then I worked my way to the shaded section. I made a cast or two, maybe three, and then felt a tug. A second steelhead went airborne flashing a silver side. This fight remained confined to the riffle with strong runs that I snubbed with different angles of the Spey rod. Eventually I banked the fish and again plucked out a small fly with grateful hands. My first double of the summer. On my way out I appreciated the yet mild temperature of the morning feeling only a slight perspiration. Hot days will return again, but a cool mid-summer break is most charming. Another hatchery hen in the 25 – 26 inch category. Tank top weather along the Rogue River. 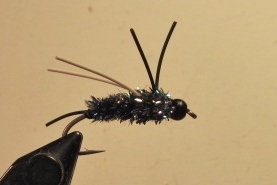 Carpetbagger Bead Head Nymphs continue to lure Rogue River chrome. The second Rogue River summer 2015 steelhead captured is a near mirror image of the first. Once again a bead head nymph was the tempting lure. This time instead of a stop I felt several tugs, then tightened and hooked the fish. The aero display again was spectacular. One fly change was required and of course the Carpetbagger in colors came through. It is that time of year again as this fine catch will illustrate. She was found at the third steelhead hole I accessed. Just about ready to call it quits for this morning on the Rogue River, the hook up to my bead head fly was most welcomed. The subsequent huge boil at the surface was eye opening. The fast streak to heavy water was amazing and the big leap was reveling. The next 7 minutes or so was “heart in the throat” excitement. The final pulling into shallow water was a relief as a better than average first fish of the summer came to hand. Top it all off, she showed the hatchery mark of a clipped adipose fin. Summer star thistle show its spiny flower heads. 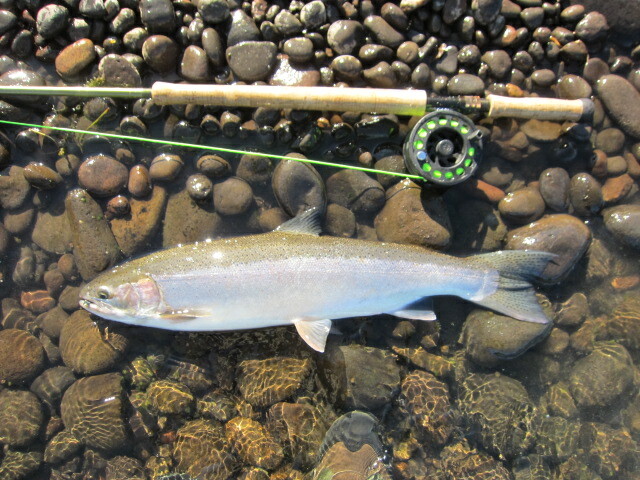 Chrome bright steelhead looks good alongside the 13′ Spey rod. Billowing and potential thunder clouds accent the Rogue Valley sky.